Announcement Best Natural Hair Care Products For Black Hair. 100% Essential Oil Infused. The Answer to Dry Hair. "Indigofera's Botanical Conditioning Creme is, hands down, the best conditioner I've ever used. After each use my hair feels clean and strong, looks shinier, and smells wonderful!" years; and this is the first time that my hair has felt like it did when I was a loose natural! It is incredibly soft! I feel like I've just discovered liquid gold for my hair! Indigofera has just become my signature hair care product! I can't thank you enough, Chanelle!" 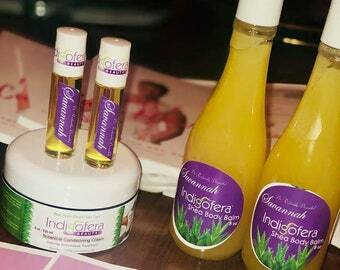 I’m a recent customer of Indigofera products and I’ve had the pleasure of speaking with Chanelle; thank you so much for your attention and resolution to my issue during that time. With that said, your products are exactly what the hair doctor ordered. I’ve been all natural for 2+ years trying all types of products. I’ve concluded my research and hair product experience with Indigofera. I love the condition and smell of my hair; it’s soft, healthy and beautiful. I rock the 1970’s Angela Davis afro and the 2-strand twistout, sometimes I’ll rollup the ends and get some pretty curls. Your products are supreme in comparison to the so-called best products for natural hair. I’m looking forward to using the latest Indigofera products you just sent me. You’re the best, don’t stop. Seen in Black Enterprise Blog, Fusion of Cultures (YT Channel), Huffingtonpost.com, BET.com, The Coil Review, Rollingout.com, Creme Magazine, Get Em Girls Guide, and more ! Always happy to help you select the right product or share beauty advice. Best Natural Hair Care Products For Black Hair. Mother's Day Gift Set. Perfume Oil Roll on. Trio Set. Fragrance. Free Shipping. My items arrived and I am sooooooo excited to use them. Everything smells soooo good, especially the Botanical Conditioning Cream. I’m already going to have to order some for my daughter. Deluxe Sample Set. Pick any 4 products. Natural HAIR Care Ritual Set. Free Shipping. Indigofera Beauty was born because a young black girl from the inner city of Philadelphia, growing up in a single parent home, refused to accept the limitations placed on her by society. While traveling to Senegal, West Africa in the year 2000, she watched creative women operate microbusinesses along the streets of Dakar selling everything from fresh fruit to handmade colorful textiles. These women began with what they had, simplifying the process of starting a business. Once Chanelle returned home to America, she launched Indigofera, “treasures for body mind and soul.” Her first collection included natural body care, gemstone jewelry, aromatherapy and imported textiles. “Indigofera” represents the beauty of the earth’s gifts and Chanelle was intentional about inspiring women to self-love, light filled living and authenticity. Indigofera’s philosophy was influenced by African consciousness, holistic healing modalities, African esthetics of beauty and the Kwanzaa principles cooperative economics and self-determination. Indigofera is more than a label on a jar. For over 16 years radiant women from across the globe have fallen in love with signature plant based products such as Organic Hair Souffle’, Fresh Pineapple Body Butter & Aura Oils. Today Chanelle speaks to women and teaches them to illuminate their businesses with joy, confidence and abundance. She is the author of Radiant Living and lives in Atlanta, Georgia with her daughter Sanai. Pumpkin Pie's Mommy. Philly bred. Holistic Beauty Visionary. RN. MBA. Creative. Down to Earth. Funny. Humble. Author. Old School Hip Hop Head. Serial Entrepreneur. Welcome to Indigofera on Etsy! "Beautiful products, which brought shine to my hair, without weight! I just love them, after only 2 uses!"